Donguibogam Village, Sancheong-gun, Friday 13 September, 7am. There’s still a long list of things I have to do before leaving. We have to pay a courtesy call on the mayor to say farewell, plus I want to pay a last visit to the Festival. And of course I need to gather everything together, trying to squeeze everything into my suitcase. I have to ditch all but six servings of dried doenjang out of the 36 that I have been given. Kyung-sook will find a home for them. I finally manage to get everything in order, and then a car draws up outside. It is the mayor, who has saved us the trouble of coming to find him. We brew some coffee for him and his driver, and I say my formal thank-yous. It is his last full year as mayor, and he is going out on a high, having seen through to completion his project for hosting the Expo. It is likely to be the last time I see him in his official capacity, and as we sip our black coffee and crunch on our slices of apple, despite the language barrier we can sense each other’s feelings. He leaves with his driver, and I load my bags into Kyung-sook’s car, locking the chalet for the last time. We drive down to the main exhibition area, managing to find an unofficial parking space, and wander in to look at the Gi Experience Village. I need to get a final top-up of gi from the Turtle Rock, and to take a look inside the big building which stands in front of it, the focus of the whole campus. The Chinese character for Gi originates from the shape in the picture. This is a sketch that represents steam coming out of a rice cooker. The steam from the pot rises up to the sky, where it forms a cloud which then transforms into rain. Rain is essential for rice to grow. And harvested rice goes back into the cooker again. This cycle is gi, which represents the flow of energy, changing its form at different phases – solid, liquid and air energy. Gi, then is bound up in the concept of the cycle of life. And opposite all these posters there were some darkened cubicles in which you could get a visual representation of your gi levels. It was all very New Age: you sat down on a cushion, had electrodes connected to your fingertips, and as you began to relax on the screen in front of you there appeared something which looked like a psychedelic jellyfish which pulsated in time with your heart-beat. 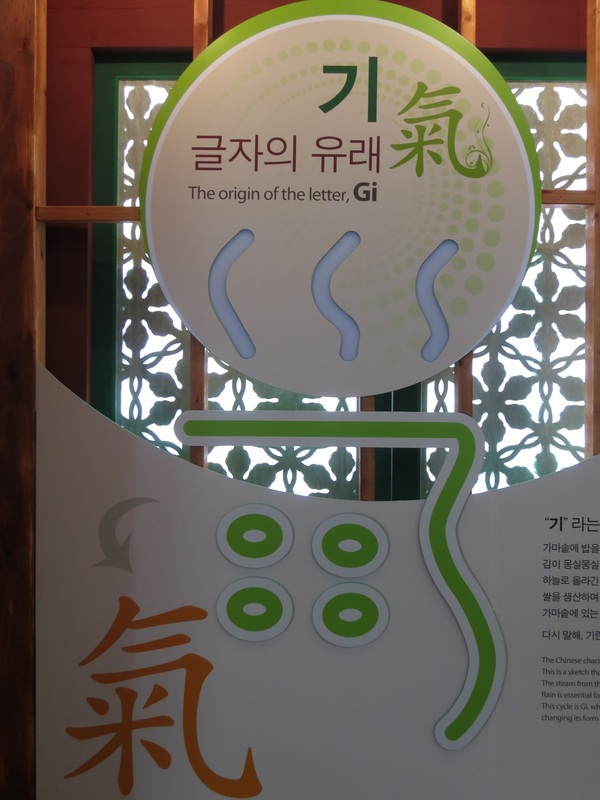 Having thoroughly explored all the gi experience that was available downstairs in the Donguijeon, we ventured upstairs, which was laid out as a meditation hall. 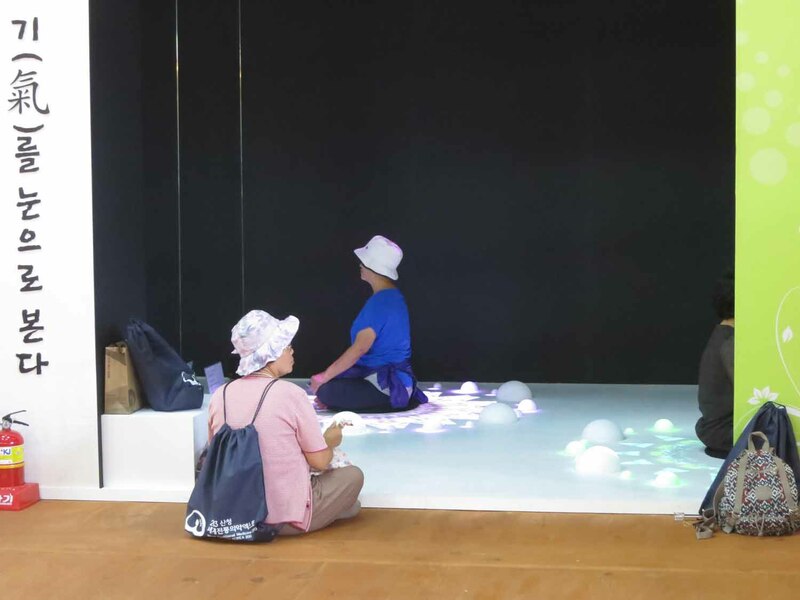 Cushions were laid out in regular rows, and one or two visitors were silently meditating facing the open windows which looked out over the Expo precints. In the corner was an eccentric-looking gentleman sitting behind a tea table. He beckoned us over. We sit and are served a very pleasant selection of local mountain teas, and during our conversation it emerged that our host was in charge of the meditation centre which also provided a healing massage service. He had a background as a professional dancer, and indeed he had danced Seungmu for Queen Elizabeth when she visited Andong in 1999. In such august company, I felt duty bound not to decline the offer of the massage experience. 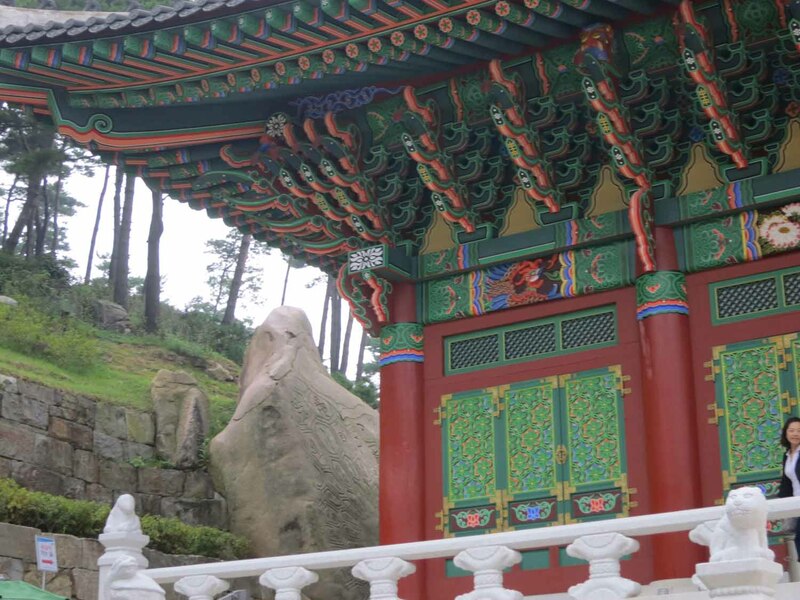 In general, I never see the point of a massage unless you’re aching after a heavy workout such as a long hike – I would have welcomed one immediately after returning from my Cheonwangbong earlier that week. In fact I actively avoid such treatments. The experience did little to convert me. My therapist is a stocky, thick-set character. You can sense the power in his body and wouldn’t want to be up against him in a scrap, but he has a gentle demeanour. What I’m sure was a most expert treatment did nothing to reverse my general antipathy. I was told I’d sleep much better after the massage, but I was sleeping fine anyway, and I could have managed without the neck-cricking, the probing of the vital organs and the vicious poking behind the knees. I was told that my lungs were damaged (diagnosed by the probing), my back was weak (diagnosed because I yowled when he ground his knuckles into the back of my knees) and I had problems with my prostate (I flinched when he probed the soles of my feet with his thumbs). I was also told I had a soul like a baby. I think I was meant to take the latter as a compliment, but maybe it was a reprimand for wincing at the pain my torturer was dishing out. At least he apologised afterwards. The pummelling I had experienced was nothing like the gentle rubbing I received from the waterbed with built-in super-jacuzzi in the Healing Village the day before, and I felt slightly insincere as I thanked him for the treatment and went back out into the fresh air. Lunch is simple herbal bibimbap and water (for once, I steer clear of beer and soju) in one of the big canteen-style tents near the Gi Experience Village. I just have time to re-visit the stall I had seen on the first day at the Expo – fabrics hand-dyed with natural dyes – where I buy an indigo and green coloured scarf for my wife, and then we’re driving into Sancheong town to catch the bus. Outside the bus station the temperature is approaching 90⁰F, and I stock up on bottled water for the journey. But inside the bus the air conditioning is efficient, and I drift in and out of sleep as far as the terminal in Seoul, where I arrive 10 minutes early, shortly before 5pm.